I was really excited that this data-sciencey technology existed on the front-end instead of just in more traditional data science languages like Python or R.
I thought all of the above projects were very interesting, and they all had relatively similar star-level's on GitHub. 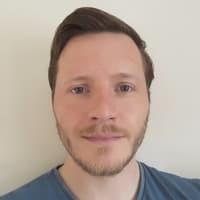 I decided to use Tracking.js because the documentation was really good, and there were a bunch of examples which, for me is the easiest way to learn! I do wish there was better documentation on what was going on behind the scenes with this library -- I'm not sure what statistics are going on or how the tool works past implementation. That being said, it was very easy to implement. 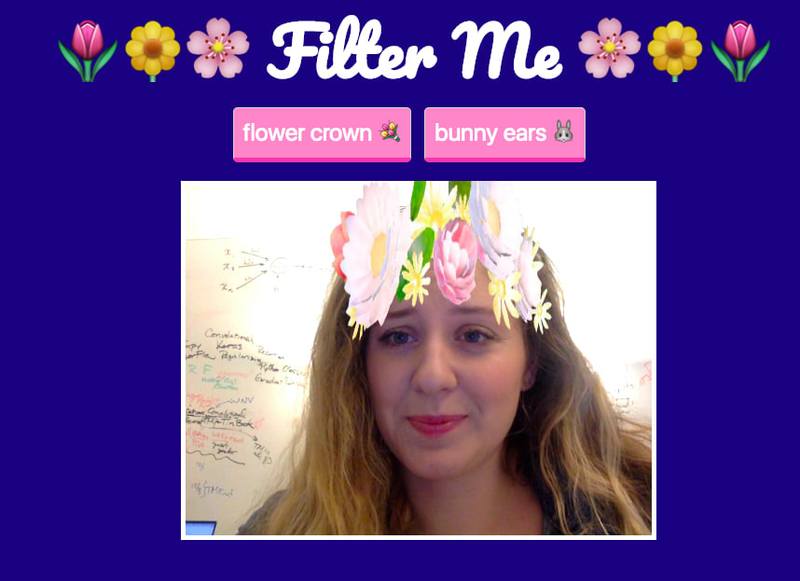 I could easily extend the face camera example for the purposes of the app I ended up building! Since Tracking.js is a smaller library with less of a community behind it than I normally end up using, my learning was pretty limited to looking at the examples on their website. I did search Codepen, but the few pens on there seemed to be incomplete or very similar to the examples. Warning: I definitely learned throughout this project that webcam selfies are super awkward! I have no idea how I had a webcam selfie as my profile pic on Facebook back in high school! 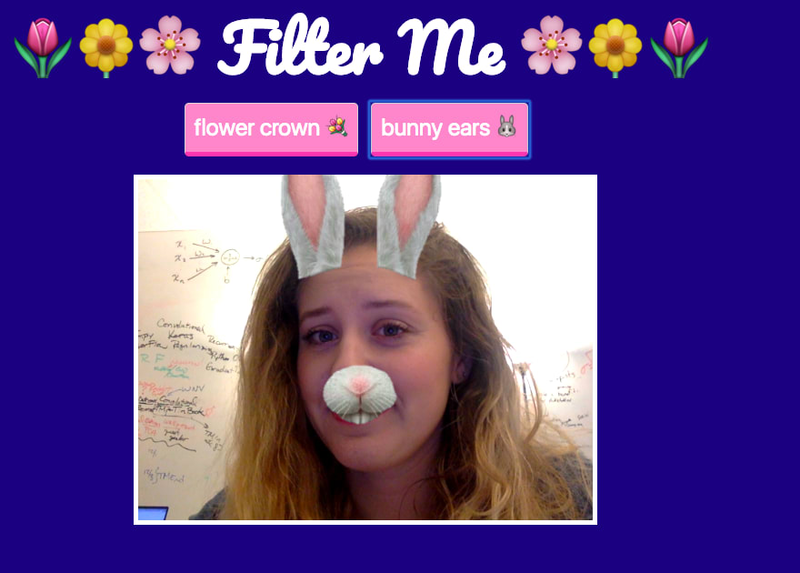 I started off by copying the face camera example on the tracking.js site. I ended up getting it working locally, with a few tweaks, and with downloading the tracking library locally. 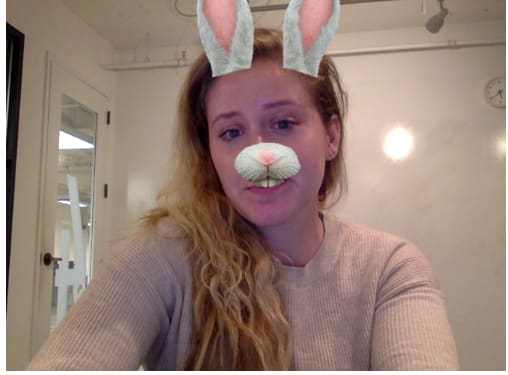 I also tried to implement the dog face that Snapchat has, but the math turned out to be too specific to the person's face for something as quick as this project! After that, I polished up the CSS, which was really hard! The way this ended up working was layering a HTML Canvas over a video element, so getting the grid system to align everything was really tricky. 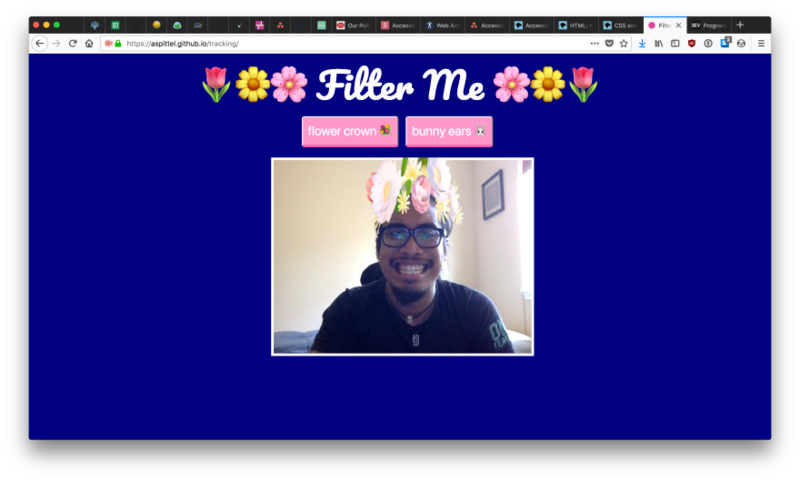 I ended up plugging in CSS Grid for the first time to see if that would work. It ended up working, but the way I did it felt hacky. I will have to keep looking at CSS Grid in the future! My final output seems okay, it is by no means perfect, but to get it better I would probably have to create my own library or my own filters. I also really struggled to get more complex filters to work. I would have had to break them up into their parts -- like each ear and the nose -- and then figure out the math to add these to each face. I seemed to have issues linking the different facial features back together if I wanted to track the eyes or mouth separately, rather than the face as a whole. If I wanted to put more into this project, I would probably have also tried to add some smoothing so that the filter jumps less when a person moved a tiny bit. Overall, the project probably could have been better but I achieved what I wanted to in order to learn the library. Tracking.js is really cool and well documented! I think its a great library for doing something simple like this app. If I were to do this for a job or something larger, I would probably have to improve a lot of the functionality in the app. 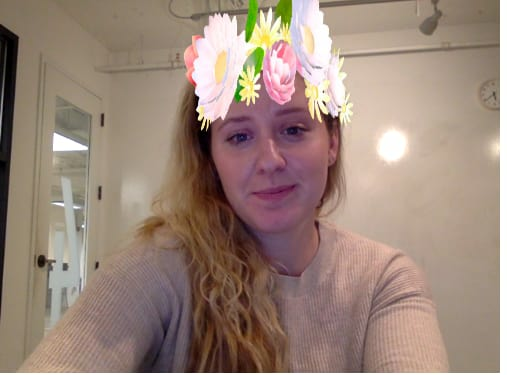 I also found the webcam API to be shockingly difficult to use -- I struggled to find examples of styling and picture taking online. I would also like to look into it more in the future. Overall, I had fun with this! It isn't perfect, but it was a good quick project. Fantastic work! You could try implementing lerping to the position of the overlay to combat the jagged movements! This is so cool! 💯 Did you have any issues with the library's speed at all? how to add take photo command while using this? Hi, I want to know how we can integrate tracking.js into angular 2 application? 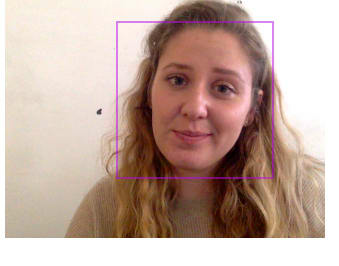 I want to use tracking.js to detect the faces from the webcam and do face recognition. How to add take photo command? so that user can take photo while using it?